Purchasing real leather in Florence is a bit overwhelming. When you walk through the streets, almost every third store seems to be selling leather goods. Jackets, handbags, wallets, etc. can be found hanging in an array of colors, styles and designs. Do I want an “Italian” leather jacket, one that is made in Italy? Do I want an “Italian leather” jacket, that is made with Italian leather? from Italy? from Florence? Jackets that cost under 200€, may indeed be made in Italy…. however the leather may have come from another country. You need to investigate and find out it the jacket is “Italian” and “real” leather, and has it been “sewn” in Italy. Not easy to do when standing in a leather store as you are relying on the store owner for this information. So what to do? There are plenty of stores that have been around for years. You can check websites from the city you are in or, go to the Tourist Information (ti) booth and ask for their advice. It more than likely will be a purchase that you plan to have for years to come so it is worth doing your homework. The owner Massimo speaks English and was just wonderful. Actually the entire staff is great and there is no pressure to buy when you enter the store. We even happen to meet Massimo’s wife, Collette; what a really nice couple! While Gary was trying on a few jackets, ya…. I did too! 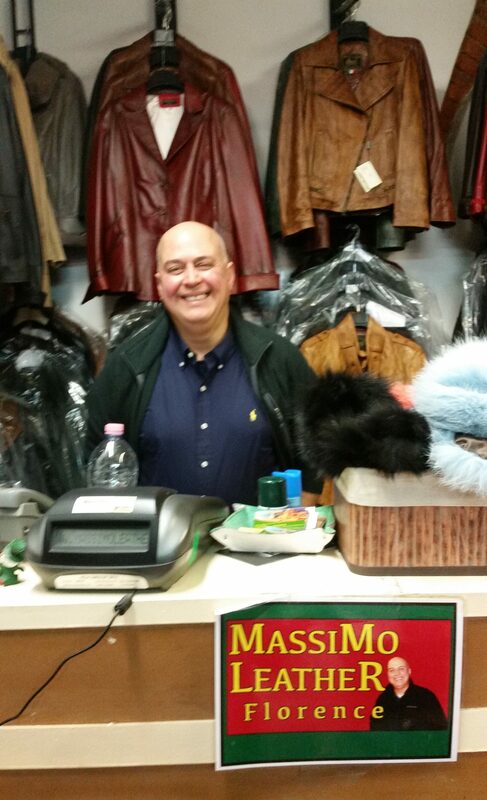 Massimo gave us a nice deal for the two jackets and even did an alteration, at no charge on our jackets. I would return to this store the next time we visit Florence.